2. On 19th July 1545 Henry VIII was watching his fleet set sail to battle the approaching French and saw the Mary Rose sink, so did the wife of Vice Admiral Sir George Carew, who was on board and who sank with his ship – not surprisingly, she fainted. 3. Scientists have used Facial Reconstruction technology to illustrate the facial features of the crew of the Mary Rose from skulls found on board. 4. As well as iron bolts, the Mary Rose was held together by thousands of wooden pegs – each one made by hand. 5. 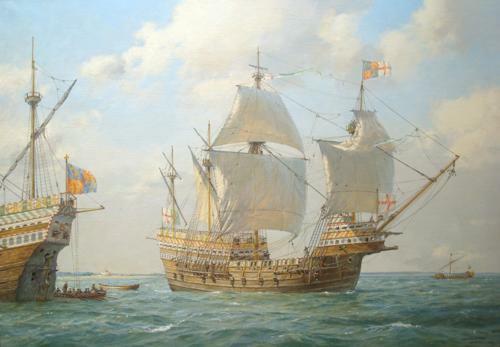 Celebrated marine artist Geoff Hunt researched the Mary Rose for 113 hours before he began his new painting of the ship, unveiled earlier this year. His research revealed that King Henry VIII’s flagship had one more fighting castle deck than had previously been thought, fuelling speculation that it was the ship’s top heaviness that may have led to her mysterious sinking. Thanks to Charli of Bell Pottinger for the above information and photos.